This blog is full of stories about broadcasting, filmmaking, and animation. But media arts students aren’t the only ones on campus using cameras. Enjoy this quick feature on what some of professor Denice Woller’s photography students are doing. A big thank you to Denice for sending us the info! In the course Photography 4, students are required to contact galleries in the hope of booking a show. 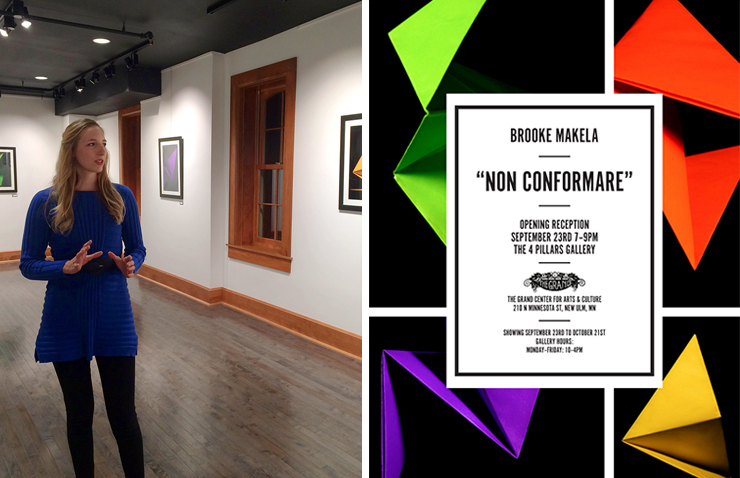 Student Brooke Makela contacted two galleries and successfully booked shows in both. One of the shows was at The Grand Center for Arts & Culture in New Ulm. The series was a culmination of her spring 2016 work in Photography 4. Below is a photo of Brooke during the gallery reception on Friday, Sept. 23, along with the show’s poster. This series was also displayed at Radiance Salon downtown Mankato. Denice’s off-campus intern Charlene Mohler has also been showing her work. She was part of a group exhibit with other students from the Art Institute International at the LaSalle Art Gallery in downtown Minneapolis. Many of the photographs Charlene exhibited were taken during her internship with Denice. Her professors report that Charlene’s work improved greatly during their time together. Denice met Charlene last May at Art-A-Whirl, an open studio tour in Northeast Minneapolis. Her work is very different from Brooke’s, as Charlene would like to become a landscape photographer (below are a few of her photos). Another fun event for photography students occurred late September at Studio Six. 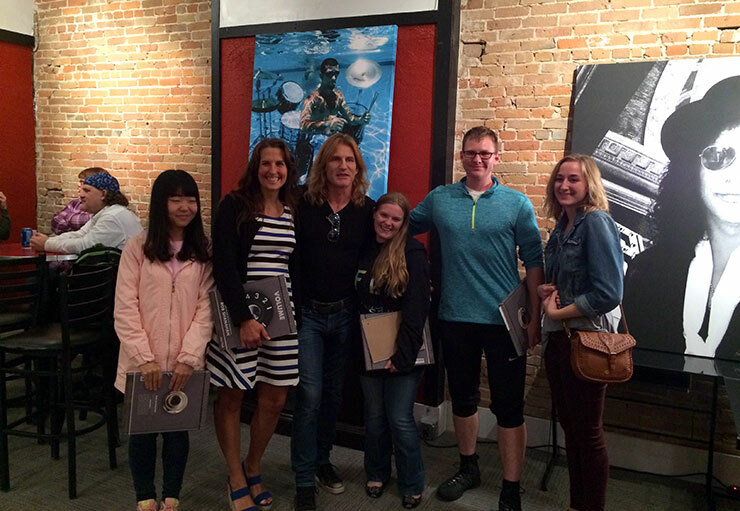 Denice took several students to a lecture by music photographer Rob Shanahan. Shanahan was brought to Mankato by Tonya Butler, MSU prof and former Media Week speaker. He is Ringo Starr’s personal photographer and one of the world’s most-published photographers in the music industry. His photos have appeared in numerous ad campaigns, on record and DVD covers, in books and magazines around the globe. It was a great event—everyone loved hearing him speak! It’s so great to see our students show their work in off-campus venues and engage in these gallery events—it shows how passionate and productive our arts community is! Stay tuned for more news on student gallery shows and exhibits.